Korma is a dish originating in South Asia which can be made with yoghurt, cream, nut and seed pastes or coconut milk; it is usually considered a type of curry. Both vegetarian and non-vegetarian kormas exist. Korma is a characteristic Persian-Indian dish which can be traced back to the 16th century and to the Mughal incursions into present-day Northern India, Pakistan and Bangladesh. Classically, a korma is defined as a dish where meat or vegetables are braised with water, stock, yoghurt or cream (the name is in fact derived from the Hindi and Urdu words for "braise"). 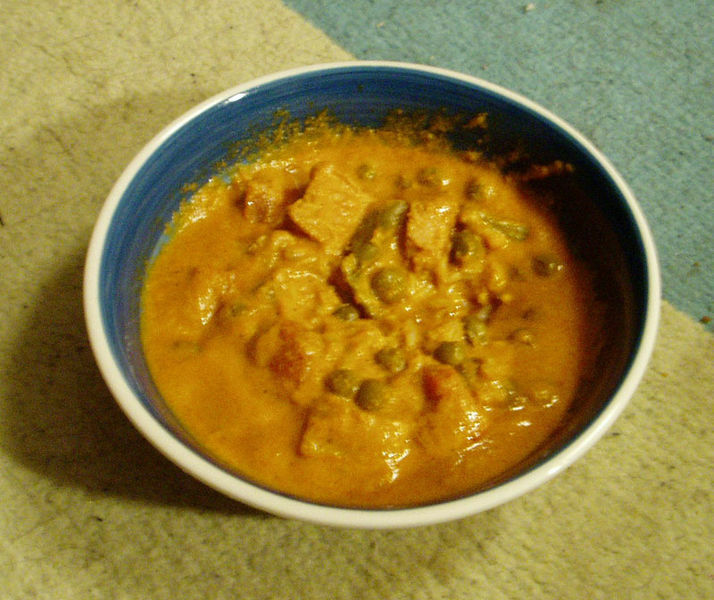 The technique covers many different styles of korma. The flavour of a korma is based on a mixture of spices, including ground coriander and cumin, combined with yoghurt kept below curdling temperature and incorporated slowly and carefully with the meat juices. Traditionally, this would have been carried out in a pot set over a very low fire, with charcoal on the lid to provide all-round heat. A korma can be mildly spiced or fiery and may use lamb, chicken, beef, game or, more rarely, pork; some kormas combine meat and vegetables such as spinach and turnip. The dopiaza, featuring a large quantity of onions, is a form of korma, as is the Kashmiri dish rogan josh or rogan gosht. The term Shahi (English: Royal), used for some kormas indicates its status as a prestige dish, rather than an everyday meal, and its association with the court. Chicken or other poultry requires fairly thorough coating with the spice mixture, or marinating, and heating evenly in cooking oil or ghee at a high enough temperature to cook through, followed by a cooling period after which yoghurt and/or cream may be added. However, lamb requires a very brief initial searing to brown the surface of each piece, followed by a braising at a continuous low temperature. This prevents the lamb from toughening, a particular problem if a large amount is to be cooked; temperature heterogeneity is difficult if the mixture is left to stand. This low cooking temperature is usually quite difficult to achieve, but if done correctly results in a memorable dish. A dish called "korma" is very popular in Indian restaurants in the United Kingdom. In the UK a korma usually refers not to a particular cooking technique but to a curry with a thick, cream-based sauce or gravy; this bears little resemblance to a classical Indian korma, as it is not braised. The korma popularised in UK curry houses is invariably mildly spicy and may often feature nuts, usually almonds or cashews, and coconut.